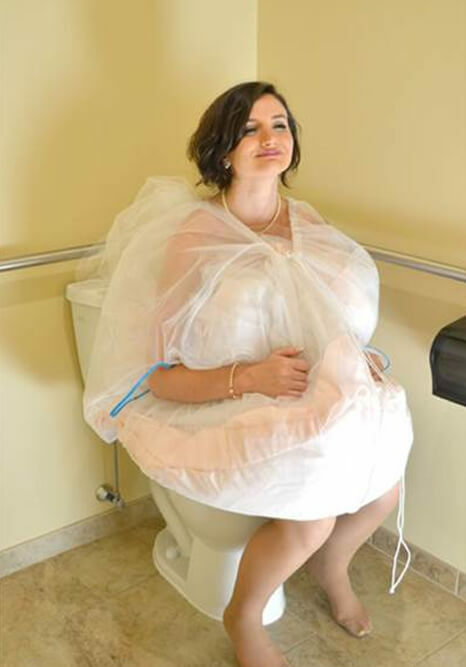 Bridal Buddy allows brides to bag up their dresses so they can use the bathroom without worrying about dunking the dress in the toilet. During her years working in a bridal shop, and later owning her own store, Heather Stenlake realised all the brides she spoke to had the same exact question after trying on wedding gowns. "Every one of them would say, 'How am I supposed to go to the bathroom in this?'" Sure, women can enlist help from bridesmaids to gather the multiple layers and several meters of lace and silk that make up so many wedding dresses, before squeezing into a bathroom stall, but Stenlake figured there had to be a better way for brides to do something as simple as use the bathroom. So she invented the Bridal Buddy BridalBuddy.net, a simple slip women wear beneath their dresses that - thanks to convenient armholes and an elastic cord - allows brides to bag up their dresses so they can use the bathroom without worrying about dunking the dress in the toilet. The slips sell for $59.95.